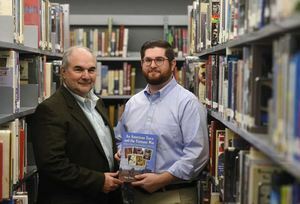 Darien Library will host Matt Pavia and Tony Pavia, authors of An American Town and the Vietnam War: Stories of Service from Stamford, Connecticut on Wednesday, December 5 at 7 p.m. Books will be available for purchase courtesy of Barrett Bookstore and refreshments will be served. Hundreds of young Americans from the town of Stamford, Conn., fought in the Vietnam War. These men and women came from all corners of the town. They were white and black, poor and wealthy. Some had not finished high school; others had graduate degrees. They served as grunts and helicopter pilots, battlefield surgeons and nurses, combat engineers and mine sweepers. Greeted with indifference and sometimes hostility upon their return home, Stamford’s veterans learned to suppress their memories in a nation fraught with political, economic and racial tensions. Now in their late 60s and 70s, these veterans have begun to tell their stories. Matt Pavia teaches English and American studies at Darien High School. He lives in Norwalk, Conn.